If you are looking for a Wireless charger compatible case for iPhone X, you are at the right place. Here we have compiled a list of best rugged and slim cases for your iPhone X that is compatible with wireless charging. Apple phone is usually expensive, and X model is the most costly of all. So, ideally, you would not want to compromise with the safety of the phone. Moreover, when you remove the case after a long time, your phone will still be like new. Whether you are searching for a rugged case or a slim case, we have picked up the best options for you. First, we will discuss the slim cases and then the rugged ones for the iPhone X. We know that iPhone X is very expensive, that’s why we started this list with the affordable cases. Zadorn slim case is very sleek and stylish. You can choose from over 30 stunning looking graphic designs. Zadorn case is made of anti-fingerprint flexible matte TPU soft rubber silicone material. The graphics not only looks stunning but the underneath material is very slim, lightweight and durable and giving your phone complete safety. A 2mm raised bumper to lift the screen off the flat surface. Looking for a transparent case with the wireless charging support, the coolqo ultra-thin flexible case might be the one you are looking for. Its clear transparent design lets you showcase the beauty of iPhone X. It is made of a high-quality material that does not get yellowish over time. It is very lightweight and once put on the phone, you won’t notice much addition in the weight. The precise cutouts for charging, speakers and sensors make it easy to charge and provide perfect cover the buttons. The electroplating on top and bottom not only prevents the corners but also looks cool. The next honorable mention is on our list of best wireless charging compatible cases for iPhone X is Anker’s Breeze case. It looks stylish and feels reliable. It is compatible with wireless charging, so you need not remove the case. It offers the military-grade protection without leaving the streamlined appearance. The buttons are highly responsive and cuts outs are precise so that everything works normally. The 3D textured back gives a good grip on the phone and raised bezels does their job to protect the screen. If the slim and transparent case is what you like, ESR will do the job for you. It is available in five options, where the color of the side frame changes rest remains the same, transparent. It is made of soft TPU material that makes it flexible, easy on the phone material and durable. You get better protection with the soft TPU cases than the hard PC cases. The bezels around the camera and screen are raised to safeguard the most vulnerable parts of the phone. The microdot pattern gives your phone a clear look and a good grip even when wet. It is just 1 mm thin, lightweight and wireless charging compatible. It is perfect to flaunt the beauty of your iPhone X and safeguard it at the same time at minimal cost. Looking for a hard case, Torras slim fit is an ultra-thin and ultra-light hard PC case. It keeps your phone safe and gives you an excellent grip on the phone. It is easy to install and take off. The cutouts are precisely made and the bezel is slightly raised around the corners. Plus, you can choose your favorite color case from plenty of colors Torras offers. The best part Torras gives the lifetime warranty on this case. It supports wireless charging wearing on the phone. Anti-fading and waterproof coloring give it a smooth finish and stylish look. looking for a transparent case with a slightly new design, Tozo Hard case might fir your requirement. It is precisely designed for iPhone X and works fine with wireless charging. The back side is transparent and the side frame is colored that offers you the option to choose from over 7 colors. It has a slim and redefined design that keeps the slim profile of the iPhone X. It provides you the 4-side protection. The corners are a slightly thicker to give extra protection to the phone and a 2 mm raised bezel to keep the screen safe when the phone drops. It is shock and scratch resistant and non-slip material used in the side frame gives a good grip even when wet. Anccer iPhone X gives many color options and graphic designs to choose for your iPhone X. It is a smooth shockproof hard case that perfectly fits on the iPhone X and doesn’t interfere with wireless charging. It is very thin, lightweight and gives you a luxurious look. If I have to choose one hard case for me, this one will be the one. The high-quality PC material withstands drops, bump, and shock. While the smooth inner material keeps the beauty of the phone intact like the new one. As the camera on the iPhone X is slightly raised, so is the case to prevent the camera from touching the surface when it falls. DTTO Romance Series case is yet another good quality case for iPhone X. It is made with liquid silicon rubber that gives it a smooth texture and anti-scratch quality. The exterior layer is non-slipping to ensure a good hold over the phone, as you would not want it to slip away from your hands. The problem with most of the cases is the heat problem, but not anymore. Its inner honeycomb design released over 80% of the heat. You won’t have to face frequent overheating which in turn will help in the longer lifespan of your phone. It snugly fit your device and gives protection while maintaining the bare-metal feel. DTTO case is wireless charging compatible and is available in various colors, making it a great case for your iPhone X.
Spigen has earned a good reputation in cases department for the premium smartphones. Whether you are looking for a sleek profile case or a rugged case, Spigen offers some stunning looking cases with high-grade protection. 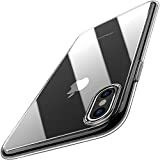 For iPhone X Spigen Ultra Hybrid case is a great option that you can look for. It works on the Air Cushion Technology to give your iPhone X high-degree protection without adding bulkiness to the phone. The clear hard PC case with TPU bumper not only safeguard your phone but also lets you showcase the real beauty of your phone. The bezels lift the screen and camera are off the ground. You won’t have to worry about wireless charging as all the iPhone X cases here are wireless charging compatible. Again we got Spigen case on this list but this time with a design and material quality. Spigen Neo Hybrid case is composed of a two-part design which contains shock-absorbent layer with the rigid bumper frame. Its form fitter design ensures the slim and pocket-friendly design of your iPhone X. Plus, the precise cutouts and tactile button feedback will make give you the feel like this case is actually a part of the phone. It is certified for Mil-Grade protection that explains itself how efficient this case is in its work. Need not to mention still to leave no doubt Spigen Neo Hybrid case for iPhone X is wireless charging compatible. Slim Cases are provided decent protection and maintain the sleek look of the phone. But if your lifestyle is a few adventures you better look for a rugged case. 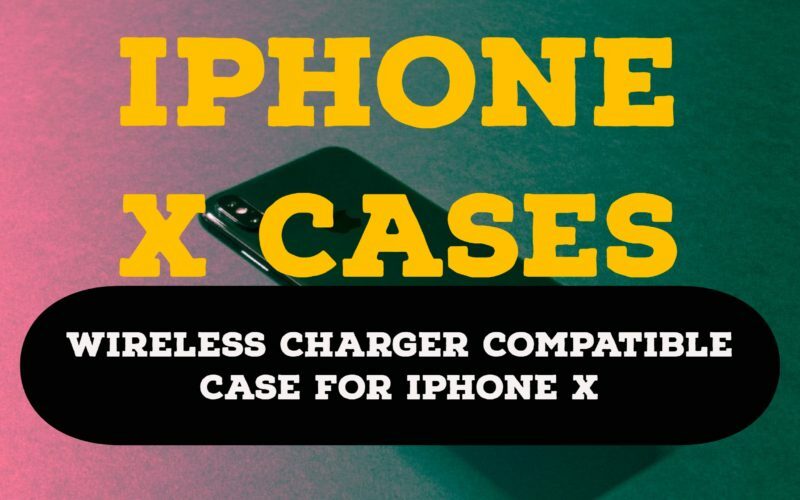 So here is our list of best-rugged cases for iPhone X which are wireless charging compatible, so no need to take off the cover unless you want to change it to a new one. There is a misconception that one can’t get a decent rugged case at a low price. 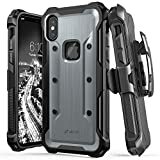 But we dig down the market and came up with the most value for money rugged cases for your iPhone X. Nasdom Hybrid Armor Defender protective case is a complete package to safeguard. It is a Hybrid of PC + TPU that gives your iPhone X military-grade protection. The corners are slightly raised for better shock absorption. You will also get a built-in screen protector for the screen. 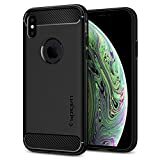 At a price of a slim case you are getting a rugged case, so its a value for money rugged case for iPhone X.
Spigen Rugged Armor case features new glossy accents and carbon fiber textures to match with the stunning looks of iPhone X. It is a slim, rugged case consist of a single TPU layer with web patterns on the inside layer. It works on Air Cushion Technology for better shock absorption than regular cases. The bezels are raised that lifts the camera and screen off the ground. This is wireless charging compatible too. Overall, this Spigen case is slim and provides the protection better than slim cases and lesser than true rugged cases. So if you are looking that provides slightly better protection than the slim cases but does not add bulkiness and weight to your iPhone X, Spigen Rugged Armor Case is for you. Anker Karapax case is a dual layer heavy duty tough military-grade certified case. Its revolutionary design comes with wireless charging support. Screen and camera of the phone are lift off the flat surface thanks to the raised bezels. The response of the button on the case is good and gives tactile feedback. The cutouts are precise and wide enough to use all standard third-party accessories. Its meticulous design and dual-layer polycarbonate hard shell and soft TPU core provide superior protection, while the 3D textures give it a stylish look and a good grip. When it comes to rugged cases for smartphones, i-Blason has to be there. 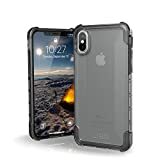 i-Blason Ares series case for iPhone X is a full-body rugged case with built-in screen protector. It is a complete package that you need to safeguard your phone from your adventures life. The dual layer clear back cover with TPU frame provide the military-grade protection. This rugged case will add weight and bulkiness to your iPhone X. But it also provides both the style and protection to your phone that you won’t get with slim cases. The multi-layer TPU bumper does the main job, and your iPhone X will survive the occasional drop without sustaining any serious damage. Silk Armor Rugged iPhone X case is an ultra-light and durable. It will keep your phone ready to withstand the occasional falls and shocks. The soft rubber grips for a firm grip even when wet. Besides the thick layer, it has protective air-pocket corners and thin air-bags on the back side that absorbs the impact of shocks pretty well. You will also get a tempered glass to prevent the screen from scratches and dust. This carbon fiber rugged case is wireless charging ready and available in two color schemes. In case if you are looking for a hard, rugged case with built-in screen protector, Supcase rugged holster is a great option to go with. This dual layer case with PC hard shell and flexible TPUs gives you complete 360-degree protection. Front Cover keeps the screen scratches free without compromising the sensitivity of touch. The cutouts are precise that won’t interfere with the functionality of the phone. The ports the fold out to prevent the dust and moisture. Supcase rugged case is military grade-grade certified, means it is drop tested at a 48-inch height for consecutive 26 times. If you want style and ruggedness at the same time, below two cases are for you. OtterBox Defender Series cases are popular for their style and durability. For iPhone, X OtterBox has made around eight graphical and paint schemes to match with your style statement. Now you won’t have to be restricted to just transparent or black cases. It has a screenless design with solid inner shell and soft outer cover. You will also get a belt-clip holster for hands-free viewing. The port covers prevent the dust and debris from getting in. Urban Armor Gear Pathfinder feather-light rugged case looks bulky but doesn’t add much weight to the phone. With more than 20 color and graphical options to choose you don’t have to compromise how your case looks. The softly raised rubber screen-lip and rear skid pads give your iPhone X complete 360-degree protection. The buttons give ultra-tactile feedback for improved functionality even with the cover on. UAG pathfinder rugged case meets the military drop-test standards [MIL STD 810G 516.6], so you can count on it. This UAG case is Apple Pay and wireless charging compatible.